Even though there are currently no plans for Supergirl to cross over with Arrow and The Flash, the upcoming CBS series isn’t leaving the Girl of Steel in a world without other DC superheroes (excluding her famous cousin, of course). Last month, during the TCA press tour, the Supergirl team revealed that Justice Leaguer Red Tornado would eventually join the series. Now it’s been announced that Salem star Iddo Goldberg has been cast both as Dr. T.O. Morrow and the show’s version of the wind manipulating android. Supergirl’s Red Tornado is being described as the “the most advanced android the world has ever seen,” according to Comicbook.com. The android was built by Morrow to be the U.S. Army’s most powerful weapon, but after it becomes sentient, it will pose a danger to the people of National City, including Kara Zor-El’s loved ones. What’s curious about Goldberg’s casting is its dual nature. 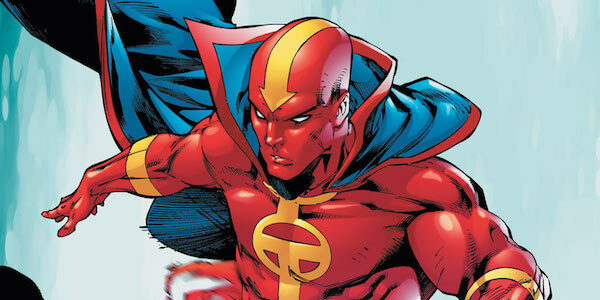 In the comics, although Morrow is also Red Tornado’s creator, they are separate individuals. It's possible that Morrow and Red Tornado may somehow be fused on the series; but as it stands now, Goldberg will be playing both creator and creation. It will be interesting to see whether they are somehow combined or if Red Tornado just happens to bare the same likeness as Morrow, who may end up becoming a supervillain like his comic book counterpart. Red Tornado was originally built by T.O. Morrow in the comics as a weapon against the Justice League, but much like how Marvel android The Vision rebelled against Ultron, Red Tornado was able to fight his original programming and become a superhero. As time went on, he developed his own personality, and when not fighting threats to humanity, he lived among humans in a small town as teacher John Smith. Red Tornado has previously appeared on animated shows like Justice League Unlimited, Batman: The Brave and the Bold and Young Justice. It’s also worth noting that in the current Earth 2 comics, Lois Lane’s mind has been downloaded into a Red Tornado body, so perhaps that’s a fate that may be in store for Lois or her sister Lucy on the series, thus resulting in two Red Tornadoes running around on Supergirl. In addition to his role as Isaac Walton in WGN’s Salem, Goldberg’s resume also includes Secret Diary of a Call Girl, Mob City, Peaky Blinders and the recent Spike miniseries Tut. Red Tornado is the latest adversary - we’re hesitant to call him a supervillain as of right now given his history as a superhero - that’s been announced for Supergirl. Other foes Kara will face include Vartox, Reactron, Livewire and Hellgrammite. Following its premiere on Monday, October 26, on CBS at 8:30 p.m., Supergirl will move to its normal Monday timeslot at 8 p.m. on November 2.